NASHVILLE, Tenn. — The Army is working to extend the range of its airborne precision munitions in order to provide greater standoff in future contested environments. Army Vice Chief of Staff Gen. James McConville said at the Army Aviation Association of America on April 26, that the service needs to make sure it is extending the range of its current capabilities. The service prioritized long-range precision fires as its top modernization effort, and it is taking steps to extend the range of its cannon artillery on the ground in the short term. Matching that capability in the sky, the Army aviation’s research, development and engineering arm is looking to increase standoff ranges for its helicopters to effectively fire its munitions. “What we are doing is looking at capability that will give us more man-in-the-loop loiter capability of these missiles, more guided aspects, because we are going to be dealing with and seeing more GPS contested environments, RF contested environments,” Juanita Harris, director of the Army Aviation and Missile Research Development and Engineering Center, said at AAAA. “So we are making these systems now, these new multi-role guided missiles to provide that expertise and that capability to operate in those contested environments, but it also keeps the user, that pilot, the aviator in the loop; as we move forward, it allows the [Brigade Combat Team] commander to reach out to further ranges because of that new capability,” she said. 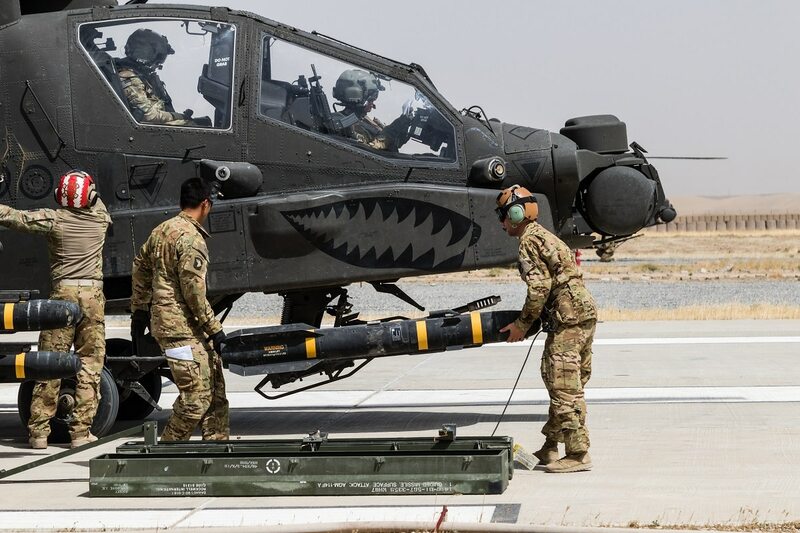 Based on some joint urgent operational needs statements from the field, the Army is tackling extending the range of precision munitions fired off of the AH-64 Apache attack helicopter, said Maj. Gen. Frank Tate, the director of aviation at the Pentagon with the Army’s operations, plans and training branch. And while the committee supports ongoing obsolescence mitigation efforts, it wants to see the Army’s plan to modernize by Sept. 15. The service is also getting closer to fielding some new lightweight precision munitions for its Gray Eagle unmanned aircraft systems, according to Tate. The Army has been looking for ways to rapidly buy lightweight precision munitions for UAS as it burns through more expensive missiles carrying out a wide variety of missions. “Right now we fire a very large number of Hellfires off of our Gray Eagles around the world against targets that don’t actually require a tank-buster, high-end precision munition,” Tate said, which are both expensive and limited in numbers because they are needed for war stockage for other contingencies against near-peer-type competitors. “What we need is a weapon system for our Gray Eagle, for example, that gets more stowed kills on the wing, so instead of one round per rail, we want at least three rounds per rail ideally,” he said. Some munitions are light enough — coming in at 6 or 7 lbs —to fit even more than three per rail, according to Tate. “If you are going after one or two personnel in the open sitting around a campfire or what not, that is adequate,” Tate said, adding it also makes more sense operationally as many of the newer UAS variants can stay in the air in excess of 30 hours. “If you send them out for a 30 hour mission with only four rounds, then you’ve got some significant issues,” he said. The Army plans to take “multiple small bets on numerous vendors,” Tate said, with solutions that sound interesting. Some munitions are already being put to the test in the Army’s software integration labs. Then the service will take them out, as early as next month, and drop some inert rounds in the desert to see if they can hit targets accurately. If these munitions are successful, the Army will then buy an economically feasible quantity and “operationally use them in real world locations,” Tate said, where users can provide feedback. If the munitions are good, the Army will order more. If they need work, then it will send them back to the vendor, according to Tate. The Army may push one vendor’s munition across the finish line while another is preparing for tests. “This is going to be more than one in a family of munitions based on different capabilities that are necessary,” Tate said. One munition may be tested and prove better than what was previously fielded, or simply offer a different capability such as more firepower or is lighter weight.